Last week I blogged about the first item I made with the dragonfly fabric I had in my stash, this is the is the second item I made with it. Once again I used my old favourite Essentials Wristlet pattern by DUMD which I enlarged to 150%. 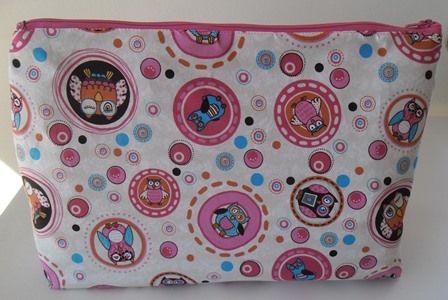 This larger size really makes a practical size zipper pouch that you can fit lots in. I cut out all my pieces for this before I cut out my Dragon Fly Tote as this was the main item I had in mind for this fabric, anything else I could make with the fabric was a bonus. 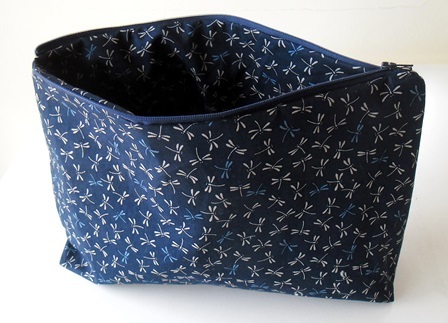 I have used the same fabric on the inside of this tote as well on the outside, it really is a pretty fabric. I did use some woven interfacing on the inside of this pouch but only placed it so it is sitting against the outer fabric. I wanted this pouch to have some structure but not too much structure. This will be given as a gift and I am not sure what the person will use it for so I didn’t want it too stiff and rigid. Just the one layer of interfacing gives it enough structure to be free standing but you can also squish it down if you wish too. 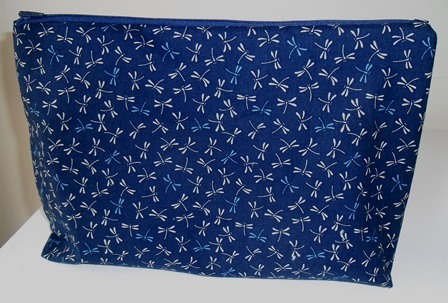 I really enjoyed making the 2 pieces from the dragon fly fabric. It was a bit of challenge to think what to make with only 1m of fabric but it was a good learning experience. I know now that for clothing unless it some cotton knit 1m of fabric is not enough to make anything entirely. I can get away with making an elastic waisted pull on skirt from 1m cotton knit but for anything else I need more fabric. I liked that I could make 2 practical items with just the 1m, I am not really a person who makes decorative items, I like practical things particularly for when making gifts for adults. I am really glad that I was able to free this fabric from my stash and use it in a gift that someone can enjoy. Fabric should be brought to be used and not just sit in your stash. When I made Daniella I wanted to make a little blanket to go with her. My original plan was to crochet her one but the one I started with some scrap yarn in my stash looked terrible to I raided my fabric scrap stash and came up with this little blanket. I have a basket of scrap pieces just under my ironing board. This project actually started with finding the back fabric first. I found a rectangle scrap of the flannelette paw print fabric in the basket and measured it over the doll. It fitted well so I decided to use this as the size blanket. The pink around the edge is part of the front boarder folded over and hand sewn in place to bind the edges. In between the 2 layers I placed a scrap piece of polar fleece to make it into a mini quilt. In the basket I initially found a pile of the little aqua heart scraps that were offcuts from when I made a previous project, they were just bigger than a 2.5″ square so I decided to use them as the guide for my pieces. In the basket I also found pieces of the 2 grey bubble fabrics, these were perfect as the blanket was for the child that I used those fabrics in originally in. 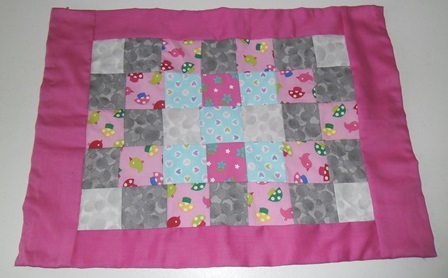 I love it when I can incorporate the same fabric into multiple projects for the same child. 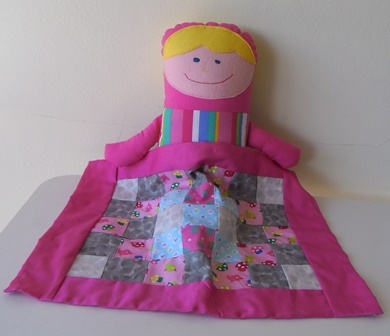 The other fabrics were from strips I found in the basket, I wanted to keep mostly pink to match the doll. I cut all the fabrics I found to a 2.5″ then played around to get them to fit the backing fabric nicely. I took a photo of the final layout on my phone to ensure that I stitched them in the correct order, thankfully I didn’t need to refer back to the photo as I got the order correct. I am super happy with this little blanket as it turned out really well. The colours all match in with the doll and as a bonus I used fabrics from a previous gift for the child. The child can actually use this on the other toy I made her too if she wants. This project cost me nothing as it all came from my stash which was another bonus and it helped me declutter some of my scraps so everyone was a winner. Once again the pattern I used was Polly from The Big Book of Sofites. 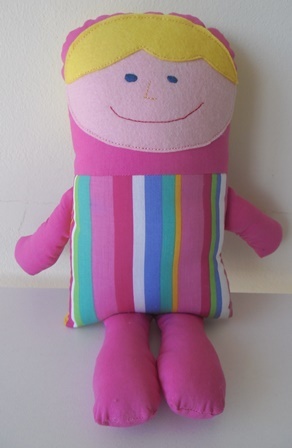 Polly is a really simple cloth doll pattern. Polly is a great doll to make from stash as you don’t need that much fabric to make her. As she doesn’t having any choking pieces this toy is great for a child under the age of 3. The only thing I needed to buy to make this doll was the yellow wool felt for the hair, all other fabrics used were from my stash. 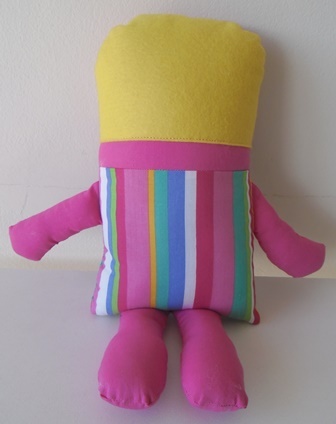 For this doll I have used the same fabrics on all the limbs but I have made other versions where the arms were different fabrics from the legs, this is can easily be made from scraps. The face is hand embroidered and I hand stitched it to the head with just regular embroidery floss. This time on the back I decided to put the yellow felt on the back like hair, the original pattern has the back area plain. The child I am making this for has blonde hair so I wanted her doll to match. I made the hair piece a little shorter than the entire head piece as I wanted it to stand out as hair. I just did a row of hand stitching with embroidery floss to hold it down, the top section is just stitched into the regular seam allowance. I must point out that I make this doll a little larger than the pattern, I had length to the head and body sections and make the arms and legs slightly bigger. I just like the look of the slightly bigger doll. I am really happy with the main body section as I cut the pieces so that the stripes would continue the same way and line up at the sides and bottom. Little details that I know are there but aren’t that important. As you can see from the way she is sitting her limbs are fully flexible so she is perfect for cuddling. Little bit sad now I don’t have anymore kids to make Polly for now, I think each family I make toys for has a Polly in their toy box. For the first time in months on Saturday I actually got on my sewing machine! I was one gift behind on my gifts this year so I got in and made this zipper pouch to get me up to date. The pattern I used was my old favourite Dog Under My Desk pattern the Essential Wristlet. Without doubt this is my go to pattern whenever I want a zipper pouch. I have made so many of them over the years for gifts but also for myself. This is the enlarged version where the pattern piece I used measured 50% bigger than the regular size that comes in the pattern, it is simple to enlarge to set the printer to print at 150% not 100% and extend the length of your zipper by about 2″ I need to make more of these for myself, they are a great size bag for yarn projects. If you have followed my blog over the years I’m sure you have guessed this is for my owl obsessed niece. I’m still always on the hunt for owl fabrics, when I went to the craft show this year my mission was to hunt down owl fabric for this pouch. I really like the outer fabric, it is fun but just a little bit grown up which means she can use this for years to come. Do you ever see a design or pattern and instantly know who it is perfect for? Last year I came across the Meandering Paws patterns by Amy B Stitched. 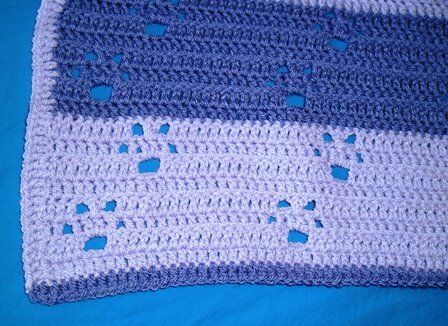 They are a series of crochet patterns with the key design of a set of paw prints. There are a number of patterns in the series now including scarves, beanie and mug cozy. To learn the initial design I made a dishcloth which was one block repeat of the scarf pattern. These are always easy to practice on and an item that I can never have too many of. It was like doing a tension square when you are knitting. The pattern is easy to follow written in US terms with the only unusual element of the cross stitch in the centre of the paw, once you get the hang of it you will find it simple to do. Thinking of my friends lifestyle I decide the blanket would be the best pattern to make her. The original blanket pattern is done in multicoloured stripes but the benefit of making gifts yourself is that you get to select which colours you want to make it in so I chose 2 shades of Stylecraft Special DK in purple tones Violet and Wisteria. I wanted a low fuss blanket that could easily be thrown into the wash without thinking so that is why I used this yarn, it is really soft too. I crocheted mine a little different to the pattern. I chained 180 stitches (plus 2 extra) and used a 4mm hook. 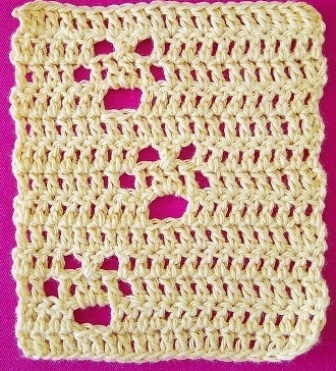 The original pattern has 3 paws to be a repeat of the pattern like I did in the dishcloth. The way I wanted to do even colour blocks this would have looked messy. By doing a repeat of the first 8 rows of the pattern I could line 2 paws up per colour block. I like the look of it, it doesn’t look cluttered if that makes sense. There is a bit of counting in this but really only in your set up row for each paw. 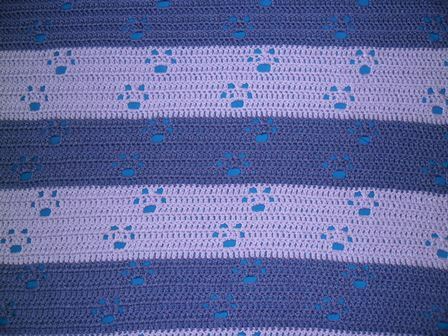 Once you get that initial row in which has the gap in the base of the paw you then really don’t have to count because as you do the pattern you learn where you are meant to be in each section so for example if you are not one stitch off from where you need to do a chain 1 skip then you have made mistake somewhere. I did have to frog it back a few times the biggest was about half a colour block. Doing the 8 row repeat meant you learnt the pattern quickly. For the border or edge I opted for something simple. I did one row of trebles half the blanket is light purple the other half in dark. It was a short edge and a long edge in one colour so at 2 opposite corners you can see the 2 shades. As I started my colour blocks in a light colour I ended in it a dark colour. On the border I did the opposite so the border frames it. I started this August 2017 and finished March 2018. A lot of tv crochet. It was very relaxing to do and once I finished it I missed it. I wasn’t sure how much yarn I needed so I purchased 6 in each colour. I used a 5 and a bit of each colour. 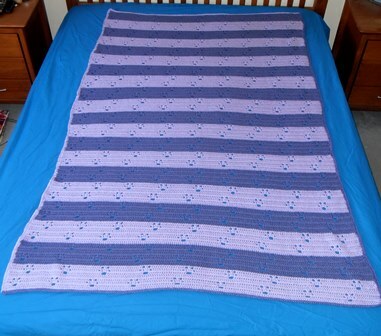 The finished blanket measures 48″ x 72″ so it is a nice lounge blanket. 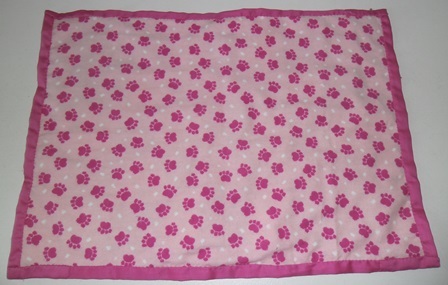 It is fitting that I write about this blanket today as it is the recipient’s birthday and she has received her gift. In previous years for my gifts I have made a lot of individual items which were often very detailed a little on the complicated side to make. Unfortunately this year I don’t have as much time and energy to spend on my gifts (even though I enjoy making them) I have decided this year I am keeping my gift making simple and letting the fabrics be the star so the kids are still getting gifts they are going to love. 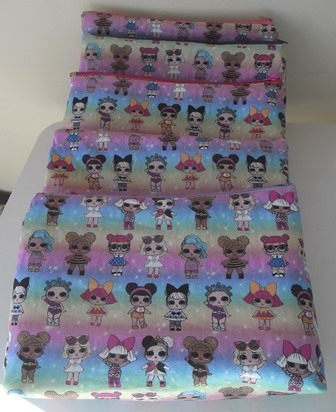 At Christmas one niece was particularly obsessed with LOL Surprise dolls so when I saw that Self Confessed Fabrics Addicts had some fabric available with the dolls printed on it I ordered 1m. I had no idea what I would make but I knew 1m of cotton fabric would be enough. 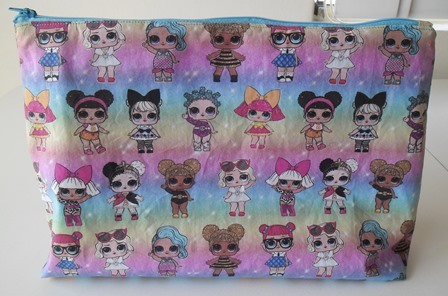 I started seeing that the other girls I am make gifts for also like the dolls so I thought ok what is the maximum way I can stretch out my fabric to use in all the gifts. The obvious choice was my tried and test zipper pouch pattern. I use the Boxed Corner version of the Essential Wristlet by Dog Under My Desk which I have enlarged to 150%. Kids love little bags they can put their treasures in, I use my zipper pouches all the time and I know they can hold a lot of things in them. This pattern is very easy to do (I still follow the instructions even though I have lost count of how many I have made) and it is a pattern you can sew in bulk which is perfect for gift making. In total I have made 7 with the LOL fabric. 2 pouches have the fabric on both sides on the outside, the other 5 only have it on the front of the pouch. By doing it this way I could get the maximum pouches out of my fabric. 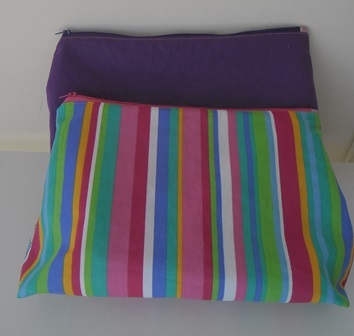 The backing fabric I used on the 5 were a combination of some striped fabric I picked up at a recent fabric swap which matched in with the colours on the front and some purple fabric which I had already cut out for a zipper pouch but hadn’t made as I changed my mind. By having a combination it meant that if one family had 2 girls in it each one could have a different bag they knew was theirs which hopefully means no fighting. Again on the inside of each one I used a combination of lining fabrics. Half the lining fabrics I had in my stash already the other half I picked up at the fabric swap. When I was at the swap I was “shopping” for fabrics I thought would go with the pouches and I think these do. All the zippers used came from my stash but I did stock up for zips at a recent sale with these pouches in mind. I need to restock my zipper pile now as I am running low on purple and pink zips. I used sure sew medium weight sew in interfacing in the pouches. I brought a roll of it from McCalls last year. I placed a layer behind every piece so that is 4 pieces per bag. It give it some nice structure. 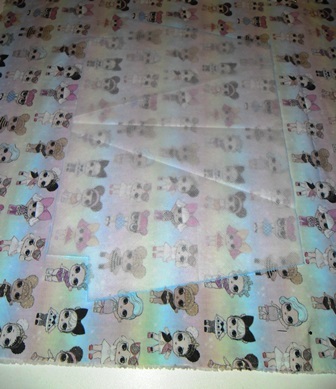 In total I had to cut 56 pieces between the lining, outer and interfacing pieces. In the past I would’ve doubled over the fabric, pinned my pattern piece and then cut it out. This method is great if you are only doing one or two items but it does lead to waste and is time consuming. After watching others at the Cashmerette retreats trace out their pattern directly on to the fabric I decided to give it ago. The pattern piece is just a series of straight lines so I easily traced around it with my quilting ruler. For the LOL fabric it really meant I could squish my pieces together and get the maximum out of my fabric. On the interfacing I cut sections from the roll and doubled over the large piece so I could trace 2 pattern pieces at once. On straight lines this method was much quicker than my regular pinning method. I am really pleased with these zipper pouches. I can remember being obsessed with different toys as a kid (and teenager) I think if I had gotten a gift like this I would be really happy. I now only have 4 more birthday gifts to make this year. I am hoping to get those done soon. 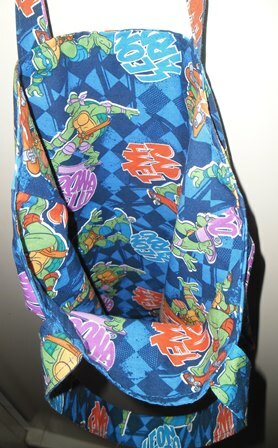 I mentioned in my previous post that I was inspired to make the masks after picking up some fabric that had the Teenage Mutant Ninja Turtles on it. The fabric was about 1m in length. I wanted a quick and easy project that would also be practical. I decided on a simple tote bag that could be used as a library bag or a toy storage bag or toss things in it and carry around the house bag. 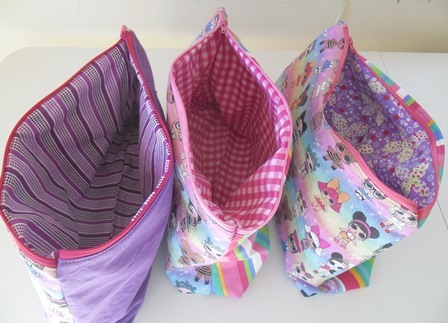 Boy or girl little kids like bags that they can put stuff in, parents love storage too! Construction wise this bag is your basic run of the mill lined tote bag. The outer, lining and handles are all with same fabric. To put it in a nutshell make the 3 sections (outer, lining and handles) and assemble them all together. You can make these any size you like but this one is probably about 12″ x 15″, the finished handles are 1″ wide. The fabric is the star in this bag so I kept it simple. 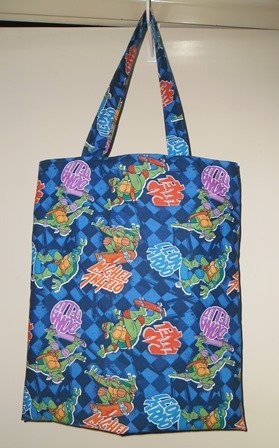 A bag like this is quick to make. This is one project I can actually make it one hit (cut it, sew it, photograph it) With the eye masks inside this is now wrapped up ready to go to its new home.